Whether for work or casual wear, the Jerzees 29M Dri-Power 50/50 T-Shirt is sure to become a favorite in your closet. Humans who perspire enjoy the advanced moisture-wicking properties of this 50/50 poly/cotton blend. By drawing moisture away from the body, you stay drier and cooler when you need it most. Preshrunk jersey fabric and a seamless design make this shirt ideal for adhering heat transfers and screen print onto the wide printing area. Points of wear, like the neckline, sleeves and bottom hem, are double-needle stitched for added durability. The seamless 1x1 rib collar with tear away tag adds a subtle but important detail of extra comfort. Shoulder-to-shoulder taping adds comfort by covering the raw edge of the sewing construction and enhances the reliable wear of the tee shirt. 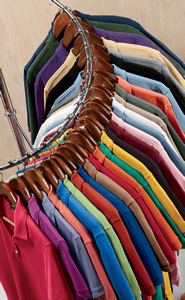 With 48 colors to choose from and a broad array of sizes, you will easily be able to coordinate matching styles for yourself or everyone in the family.